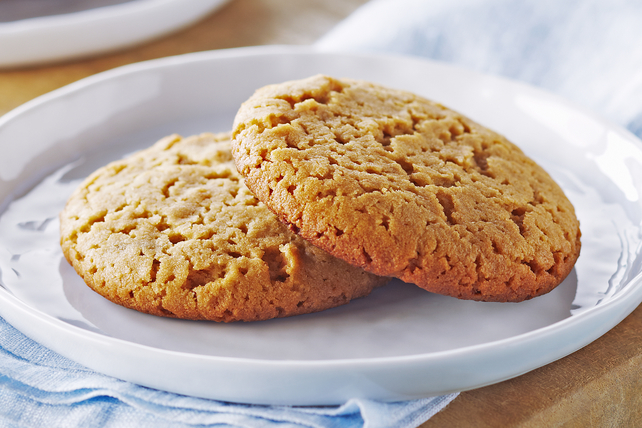 These delectable peanut butter cookies have a light, crisp texture. Cook butter in saucepan on medium heat 10 min. or until solids separate and butter takes on a nutty aroma, stirring occasionally. Cool 30 min. or to room temperature. Meanwhile, mix flour, baking soda and ammonium carbonate. Heat oven to 350ºF. Beat eggs, peanut butter, sugar and butter in large bowl with mixer until blended. Add flour mixture; beat just until blended. Roll dough into 68 (1-inch) balls, using about 1 Tbsp. dough for each. Place, 2 inches apart, on parchment-covered baking sheets. Flatten each to 1-1/2-inch round. Bake 10 min. or until lightly browned. Cool on baking sheets 5 min. ; remove to wire racks. Cool completely. Food-grade ammonium carbonate, also known as baker’s ammonia, pre-dates baking powder and baking soda as a leavening agent. Used first in Scandinavian regions, it is still used today in old-fashioned recipes where crisp and light cookies or pastries are desired. The strong ammonia smell produced when the desserts are baked will dissappear in the finished desserts. Look for ammonium carbonate in the seasonings section of Asian grocery stores. If you don't have ammonium carbonate, you can use an equal amount of baking powder to make this cookie dough. The cookies just won't be as crisp as those made with the ammonium carbonate.